PC 1.3.1 : Mechanics and Controller Support! Discussion in 'PC - Re-Logic' started by Cenx, May 20, 2016. Reason: we're a few updates past this now. Good morning Terrarians! I want to start this announcement thread for 1.3.1 by thanking our amazing team for their hardwork and dedication to this update. @Yoraiz0r had his work cut out for him with adding controller support to an engine that was not built for it. Not only did he make it work but he made it work so beautifully, thank you so much! @Lazure as always did a fantastic job providing assets to a sometimes too picky team. Thank you for your creativity and patience! @Arkhalis and the entire beta testing team- You rock! This update would have been a little messy without you! Everyone else behind the scenes- You know you are very much loved and appreciated!! Now that all that mushy business is out of the way we can jump back into things! This update is focused on new mechanics and controller support- yay! Thank you everyone who provided suggestions in the mechanics suggestion thread- you gave us some great ideas! Below you will find the changelog as well as some other fancy things to check out, please read through everything before jumping into the game, I promise it is worth it! MAPMAKERS REJOICE - ADVENTURE MAPS ARE BACK WITH A VENGEANCE! One of the coolest aspects of this update is the way in which it makes mapmaking both easier and more in-depth! 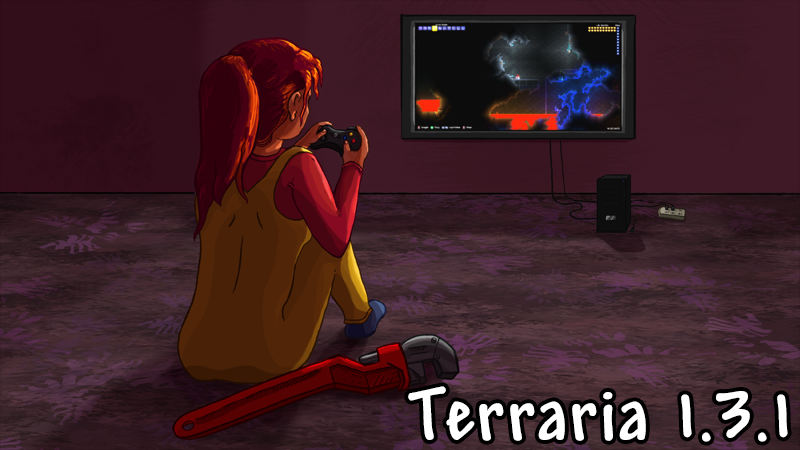 For those that are not aware, earlier in Terraria's life, there were a ton of custom maps - covering everything from standalone Adventures to Parkour to PVP and more - created by players for easy download and play. Theses maps utilized clever building skills and a defined set of rules to transform "vanilla" Terraria into a fresh experience. We are really hoping that Terraria 1.3.1 will trigger a renaissance of this kind of shared player creations! To download the Tales of the Terrarian Map, simply click the image above! For a brief description, screenshots, and other information about this brand new Adventure Map that uses a lot of what 1.3.1 has to offer, check out the Official Thread for Tales of the Terrarian! While you are there, be sure to share your feedback and appreciation for the amazing work these two put together here! Our entire team was impressed, to put it mildly. Dart Traps & all Temple Traps can now be hammered to rotate 90 degrees at a time. Added smart interact, making chatting with NPCs, opening doors and using objects easier. You can now use situational building accessories from your inventory and toggle their effects like info accessories. Added Team Blocks and Platforms. Added Weighted Pressure Plates (4 colors). Added 12 new craftable Critter Statues. Medusa can no longer petrify players directly above her. Added NPC names for the painter, wizard, and skeleton merchant, based on contest results. You can now find Beehives in the Jungle - Not the bees! Torches can now be put on actuated tiles. Slimes should no longer be able to go through 1 block high gaps. Target dummies no longer benefit from lifesteal or spectre set. Fixed popular NPC Housing exploit. Brain of Cthulhu & Eater of Worlds now properly leave upon massacring the player / if the player leaves their territory. Fixed shenanigans with actuating gemspark blocks. Tiles under Lihzahrd altars can no longer be actuated until the golem is defeated. Fixed items that cost less than 5 copper always sell for 1 copper , even when sold in Stacks. MegaToadmaster, Vagrant, fffffffffffffffff and 102 others like this. MegaToadmaster, Walkengopgop12, fffffffffffffffff and 35 others like this. Don't let me down community! I want to see some amazing creations & custom maps!! MikeTheGreat, fffffffffffffffff, Teal and 21 others like this. Yay, finally. Time to sleep. Zafang and Tsuki like this. My Controller has been waiting for this! Time to explore the new treasures that are in store and build some cool stuff! Teal, Zafang, DankySkeleton and 4 others like this. Teal, Zaii, Zafang and 5 others like this. I'm going to build a gate out of logic gates that opens when you meet specific criteria of the logic gates it consists of. I've reached the peak of our technological capabilities of what we can do with logic gates. Teal, Vorcov, Zafang and 2 others like this. Time to watch the fan made maps section EXPLODE! Teal, Sylent :^), Zafang and 6 others like this. Thanks for the hard work again re-logic. Terraria definitively has come a long way. zjemily, Zafang and Purple Ninja like this. Can't wait to get this going! Good job! Zafang and Purple Ninja like this. Thank you, thank you, thank you, THANK YOU! Now I need to go change my signature. Thank god, I won't need to make another new world to find all the new statues. Teal, PartyRockVamp, ninjakai03 and 6 others like this. It means Duke Fishron will be less inclined to "leave" and end the boss battle when just a screen or two away from him. DankySkeleton, Dreamtree, Sylent :^) and 4 others like this. But ... I had some homeworks to do this sunday. Teal, zjemily, ninjakai03 and 2 others like this. This is amazing! I've been playing with the update and it's just glorious! I want to say a MASSIVE thank you to all the developers for all of their work and toil to bring us only the best wiring mechanics and new features. You guys are awesome!! It so happens that I got a medusa head just yesterday for my current mage character's collection... so that's convenient of me! Purple Ninja and Chubekka like this.